This guide is a how to get started documentation for the Balloon competition loggers. It should answer most questions related to privately owned loggers. Please also take a look at the Quick Guides and the online tutorial for basic instructions on how to operate the logger in flight. 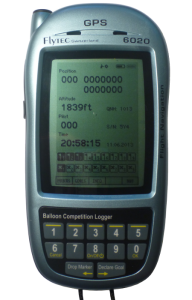 The balloon competition logger is based on Flytec 6020 hardware, but equipped with software developed by Marc André for FAI/CIA. The main purpose of the balloon loggers is to record the track of flight and to drop marker or accept declarations. The logger can be connected to laptops so that the laptop can show the same position as which is being recorded. On startup the configuration for the logger is loaded from the SD card. All configurations must be done using a computer and be saved on the SD card. On shutdown the logger saves the track to the SD card. In case the SD card is lost or the track cannot be read from the card a backup copy of the track remains inside the logger (the last 5h of recorded track). Because the Balloon Loggers are primarily designed to be used in balloon competitions many information are dedicated to officials. Usually in a balloon competition it is the event director or his staff who configures the loggers. As private owner of a logger it might also be useful to read the Official’s section of this website. For basic instructions please also see the Quick Guides and the online tutorial. The configuration of the loggers is done using a SD card. The SD card can contain two configuration files. 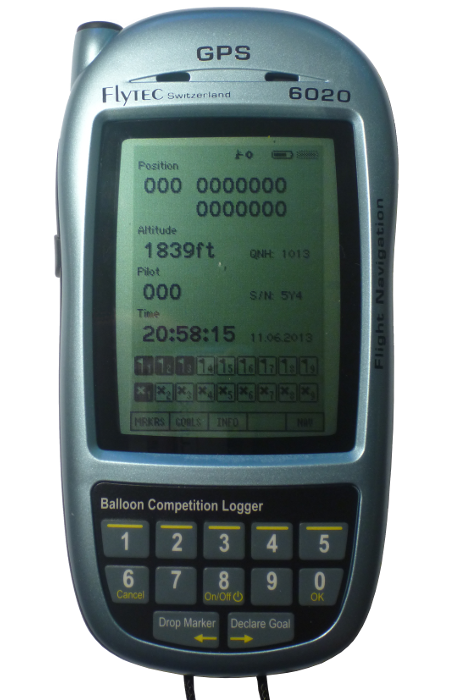 logger.cfg is used for configuration of the loggers for a balloon event by the competition organization. user.cfg can be used to configure pilot/owner specific settings. In absence of the logger.cfg, the user.cfg can also be used to configure logging/event settings. Thus private owners should only touch user.cfg while officials only touch logger.cfg. All configurations are done using BLM software, which can be downloaded here. BLM runs on Windows computers only. 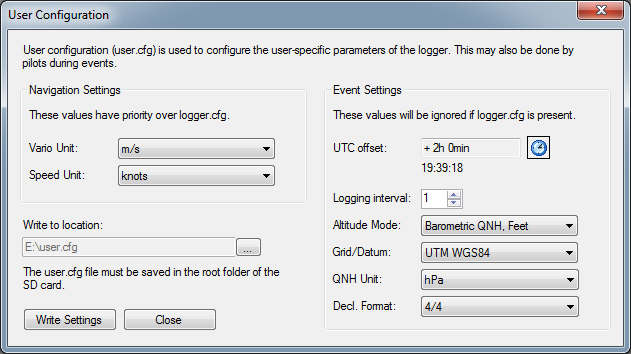 For pilot configuration select Logger->Event Configuration in the menu. You may select the units for vario-meter and ground speed indication. These values take priority over the logger.cfg settings. The event settings are only used if no logger.cfg is present. UTC offset is the time zone configuration for the clock. Logger interval sets the logging interval. 1 means every second, 3 means every 3 seconds. Altitude Mode can be used to select if barometric or GPS altitude is to be used and which altitude unit shall be used. Grid/Datum can be used to select a grid and datum system. Only a limited number of grid/datums are supported which are regularly used in balloon competitions. Declaration format is used to define if goal declarations are given in a 4-4 format or in a 5-4 format. The 5-4 format is mostly used in competitions where the competition map is across two UTM zones. The file must be stored on the SD card in the root folder with the name “user.cfg”. Select the correct filename in “Write to Location” and select “Write Settings”. Insert the SD card into the logger and start the logger. On the idle screen of the logger press Info (3) and then Config (5). You can see if your configuration is loaded correctly. The simplest way to download tracks is to remove the SD card when the logger is shut down and to insert the SD card into a SD card reader on your computer. The tracks are saved as [Logger S/N]-[Number].igc. The number is an incremental number. The IGC files can directly be loaded by many mapping applications such as Ozi Explorer or CompeGPS. If you want to read the marker drops and goal declarations use BLM (download here) to load the track file. BLM can show all marker drops and declarations and also export them as Waypoints or convert the track file to a different file format. The logger also keeps a backup copy of the last 5h in the internal memory. In case this track needs to be downloaded, please refer to this post. The logger has two banks of battery. Only one bank is active at the time. The battery status is indicated on the top right of the screen. A grayed out icon shows the in-active battery. The logger automatically switches to the other bank if one bank is empty. Fully charged batteries allow operation of approx. 15-20h. The batteries can be charged using the supplied charger. See this post for details. The logger can be connected to a computer using USB cables. Some devices are also equipped with Bluetooth. On both interfaces NMEA data is transmitted. Please see the Pilots information for details. Also see this post about connecting the logger to an Android device. All loggers receive free update of latest firmware version. The new versions are announced on the welcome page and a summary of release notes can be found in Firmware release. The firmware upgrade procedure is described in a separate page. Hardware support is provided by your Flytec dealer. Software support is provided by NTSC of FAI/CIA. Please contact us.